You are here: Home / Self Help Daily / Book Reviews / 59 Seconds: Think A Little, Change a Lot! 59 Seconds: Think A Little, Change a Lot! We’re in charge of our lives. If we want to make it happen, the next move (and all the future moves) are up to us. We can improve our lives, and ourselves, if we go about it the right way. 59 Seconds: Think a Little, Change a Lot (Borzoi Books) is filled with self improvement tips and self growth advice. The thing I love the most is that each one is backed up with research and explained in detail – with each “Why?” answered beautifully. The tips and techniques used in 59 Seconds are incredibly simple and fast (hence the 59 Seconds title). However, that wouldn’t mean beans if they weren’t powerful and effective. They are both. An example of one of the many exercises taught in this book is the writing exercise. The reader is encouraged to write a list of 3 things that he or she is grateful for. The exercise is simplistically brilliant because it gets your mind thinking in an affirmative direction. Even if you’re in the darkest of moods, once you begin thinking of things you’re thankful for, your mind will soon realize that “narrowing it down to 3” is nearly impossible. Positive, uplifting thoughts and faces will fill your mind and your mood will be lifted to a new height. The truly remarkable thing is that this mood will last for days! When it begins to dip again, make another list. There are many outstanding tips for improving your health, weight, and body image as well. Tips that are, again, backed up with wonderful research and common sense. A particularly fascinating section was devoted to a study that highlighted the benefits of knowing how much energy your body was using throughout the day – or how many calories we burn doing various activities. A chart is even included that details how many calories are burned per minute while doing daily activities. The chart includes room for the reader to write in how many minutes they spend, on average, doing this activity and how many calories they’re burning. The bottom line? None of us are burning anywhere near as many calories as we need to be or even as many as we probably think we are. Why we’re not having the type of success we think we should be having. What path leads to the type of success we want. How to jump on the right path! I’ll close with the following passage from the book because I always love for my reviews of books that I love to give you something other than just a recommendation for a great book. I want you to be able to carry something away from the post – hopefully as you head off to Amazon to purchase the wonderful book! This book is so full of great tips and golden nuggets that I just have to include two. These are two of the many, many, many “59 Seconds” tips…. 59 Seconds to THINK a little and CHANGE a lot. Richard Wiseman is based at the University of Hertfordshire in the United Kingdom and has gained an international reputation for research into offbeat areas of psychology, including deception, humor, and luck. He is the author of The Luck Factor, Quirkology, and numerous other books. A passionate advocate for science, Wiseman is well-known for his media appearances, high-profile talks, live demonstrations, and mass-participation studies. Wiseman also regularly acts as a creative consultant for print, broadcast, and new media. 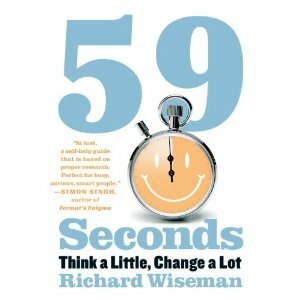 Buy 59 Seconds: Think a Little, Change a Lot on Amazon today. This one’s a must have, must read. Hi Joi, thanks for sharing an excerpt from this book. This looks like a great book; I’ll check it out! In addition to what you posted, I would like to point out that a person could be truly happy if he turns his perceived obstacles into opportunities. In order to do that, I think one has to change harmful patterns of thinking by first identifying what his fears are: is it the past or expectations from the future? Once a person discovers his limiting beliefs, he can then focus on the positive. After which, a person can take actions that will lead him towards a future filled with happiness. .-= Linda @ Self Help´s last blog ..In Search of Phrases for Effective Performance Reviews? Read This First! =-. Great point. Harmful patterns can be (and often are) our undoing. 59 Seconds is a great, great little book that I’m recommending to everyone I know! I really appreciated your book review on 59 Seconds. It sounds like the perfect solution to my current situation. I was laid off from my job and I’m feeling like I need some inspiration and motivation. It would be great if you would review another inspirational book for your readers: Little Gifts of Sustainable Contentment by C.J. Good. One minute affirmations. I was amazed at how a small book could be so powerful. I got half way through — and wow, what power! In weeks, a few of my affirmations manifested. Its like all things — if you do it, even for a few minutes, it works. If not, you are missing out on much of life’s grandeur.I recently ordered this book due to the glowing reviews on Amazon. link is: http://www.amazon.com/Little-Gifts-Sustainable-Contentment-1/dp/145284416X/ Now feel I must share this gem with you. Although I am only 3/4 of the way through, I can say this is one of the best books I have ever purchased. I am looking for a new approach to help me with a large number of problems – weight loss, addictions, love, money, health etc. 59 seconds, think a little, change a lot appears to be one solution. Little Gifts of Sustainable Contentment has definitely changed my life. I now understand how to put a thought out to the universe and make it truly happen! It could change your life too! Thank you, thank you, thank you for this posting.